This week Alisa’s weekly travel theme asks everyone to share what comes to mind when they think of the word “simplify“. 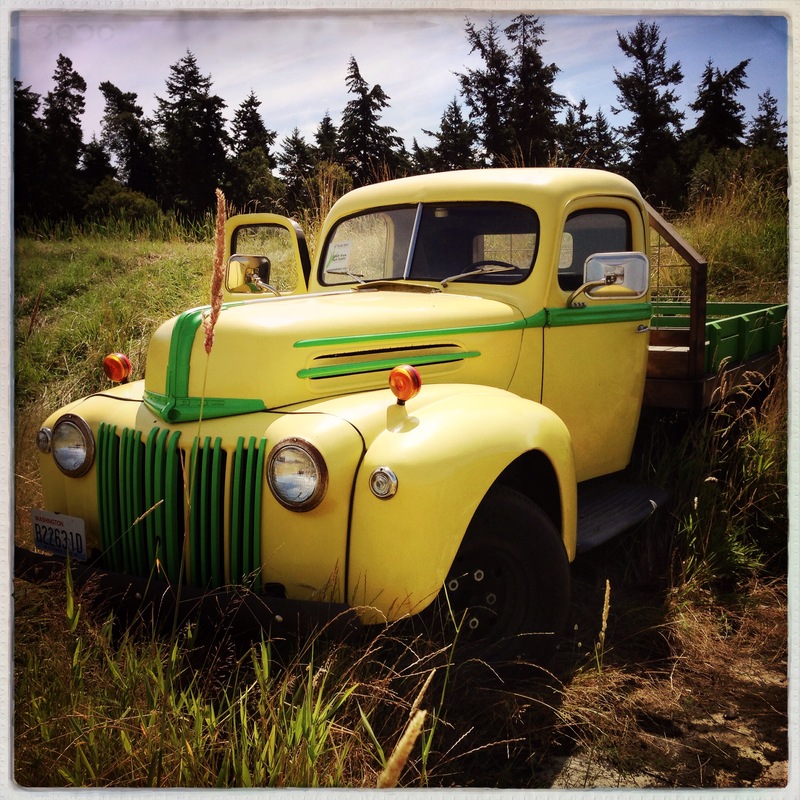 After a day of thinking about how we’ve tried to simplify one aspect of our busy days I settled on our food choices and a photo of this pretty yellow truck at Horse Drawn Farm on Lopez Island. Every week I purchase our fruits and vegetables from local farmers markets, I buy meat and poultry from a family run butcher shop and our friendly milkman delivers fresh dairy products all in an effort to make healthy meals that taste great while reducing the amount of additives and preservatives in our food. As a bonus, this change in our shopping habits has actually reduced our weekly food costs as we aren’t paying middle man mark-ups on many of the higher ticket items usually found in grocery stores. I make a habit of shopping local whenever possible and on Lopez we found several farms that sell fresh meat and produce directly from small markets in their barns. Visitors simply select what they want to purchase, write the items and prices on a list and leave money in a basket on the counter. This trip to Horse Drawn Farm included some fantastic pork chops, fresh greens, carrots and sweet peas for the table. We BBQ’d a wonderful, healthy meal on the deck and sat down to eat at sunset celebrating another fun family trip in the San Juan Islands. Has that retro quality that does evoke life from the past. I’m glad you could feel the retro-vibe from this image Sally. Shopping at the farm definitely had a different feel than a typical supermarket trip. Sounds wonderful. I try to buy local now, often it isn’t cheaper than the supermarket, but the flavour is much better! I agree, Jude when our food doesn’t spend days in transport and weeks in storage the flavor is so much better! Love this shot of the old truck. We eat very little meat and shop farmers mart all of the time too and it is right up the road. I’m glad you have a farmer’s market close to your home, Ruth. Love this photo! I always take photos of the old cars and trucks that we run across in our travels! Tomorrow is our farmer’s market day! There is something about old cars that draws me over too, D’Arcy. Enjoy your market tomorrow! What a beautiful way to simplify! Lovely take on the theme…your changes in shopping habits sound great. I grow quite a few vegetables and so at this time of year I’m able to reduce the food miles dramatically! What I love best about this post is the fact that your food bill is actually less than when you did your shopping at the big grocery stores. Proof that we need not be rich or spend oodles of money to eat healthier. Yay! Love that photo Lisa. I try to buy from the Farmer’s Market as much as I can, simply because they are fresher and sometimes organic. And also to help the farmers. Perfect shot for this challenge! We love old farm implements, trucks, farmers markets, etc. Just sorta earthy, I guess! Earthy is good, Rusha. 🙂 We like old things here too! That’s as simple as it gets =) That’s great you are able to shop locally and support the farmers and small businesses in your community. I’m glad you liked my approach to this post, Christina. 🙂 It feels great to support our local community and the food just tastes better!